When President Barack Obama travels to India next month, he will visit a country in which both he and the nation he leads are broadly popular. More than seven-in-ten Indians have confidence in the American president and about two-thirds express a favorable opinion of the United States. Indians are also feeling positive about their own country’s role in world affairs and they are optimistic about its economic future. India has enjoyed impressive economic growth in recent years, and today nearly six-in-ten Indians (57%) say their nation’s economy is in good shape. Among the 22 publics included in the spring 2010 Pew Global Attitudes survey, only the Chinese and Brazilians are more satisfied with their economic situation. Still, Indians believe their country faces a number of major challenges, including crime and corruption. And nearly two years after the deadly Mumbai attacks, 81% say terrorism is a very big problem. Moreover, a plurality of Indians characterize Lashkar-e-Taiba, the group widely blamed for the Mumbai attacks, as the greatest threat facing their country. 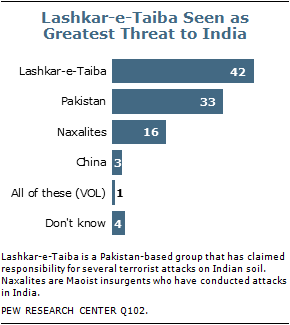 One-third name Pakistan as the greatest threat – and overwhelmingly Indians believe there is a link between these two threats: 58% say the Pakistani government actively supports extremist groups like Lashkar-e-Taiba, while another 21% think it at least tolerates them. And if these groups were to conduct another terrorist attack against India, most would support military action against them in Pakistan. Overall, Indians take a dim view of their neighbor and longtime rival: 81% express a negative opinion of Pakistan. Concern that the Pakistani state will be consumed by extremism is widespread: 78% are worried that extremists groups will take over Pakistan. Despite these tensions and a history of hostility between the two nations, most want better relations and deeper economic ties with Pakistan. More than eight-in-ten Indians (83%) say it is important that relations with Pakistan improve, while more than six-in-ten (63%) believe an increase in trade and business ties between the two countries would be good for India. And 63% also favor further talks between India and Pakistan to reduce tensions. The United States enjoys a largely positive image in India. Nearly two-thirds (66%) express a favorable opinion of the U.S., although this is down from 76% last year. By contrast, only 51% rate Russia favorably, and even fewer feel this way about the EU (36%) or China (34%). While many publics around the world continue to believe the U.S. acts unilaterally in world affairs, Indians see a more multilateral America. 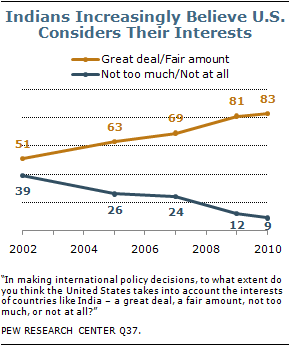 More than eight-in-ten (83%) say the U.S. takes the interests of countries like India into account when it makes foreign policy decisions – the highest percentage among the 21 nations surveyed outside the U.S. This view has become increasingly common among Indians over the last eight years – in 2002, only 51% said the U.S. considered their interests. U.S. President Barack Obama, who is scheduled to visit India and other Asian countries in November, is widely popular: 73% express confidence that Obama will do the right thing in world affairs. Indians express confident views about their country’s role in the international arena. Almost four-in-ten (38%) think India is already one of the world’s leading powers and roughly half (49%) say it will be one eventually. Only 8% believe it will never be a major power. Indians also believe their country is well-regarded abroad; 87% say India is generally liked by people in other counties. Among the 22 publics surveyed, only Indonesians (92%) are more likely to think their country enjoys international popularity. However, India actually receives mixed ratings in other Asian countries. On balance, Indonesians, Japanese, and South Koreans express positive views of India, but opinions toward India in China, and especially in Pakistan, are largely negative. Over the last several years, Indians have not shared the gloomy economic mood that has been pervasive across much of the globe. Again this year, most Indians see their country’s economy in a positive light; 57% say the economy is in good shape, although this is down from 73% in 2009. Overwhelmingly, Indians give their government high marks for its handling of the economy; 85% say it is doing a good job. And most are optimistic about the future, with 64% saying the economy will improve over the next 12 months. These ratings look even more positive when compared with other countries around the world, many of which are still struggling with the effects of the global economic downturn. China (91%) and Brazil (62%) are the only countries surveyed in which a larger percentage of respondents describe their economic situation in a positive light. China is the only nation in which the government gets higher marks for dealing with the economy (91% of Chinese approve of how their government has handled this issue). And India ranks fourth out of 22 nations in terms of optimism about the near term economic future. 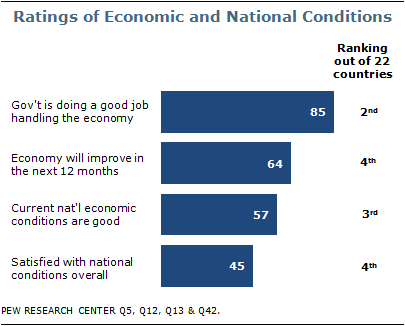 India also ranks fourth on overall satisfaction with national conditions. Even so, only 45% of Indians say they are satisfied with the way things are going in their country, while 54% are dissatisfied. In 2009, a majority (53%) had a positive view of national conditions and 46% offered a negative assessment. Indians see a number of specific challenges facing their nation. In particular, at least 80% say crime, terrorism and corruption are very big problems. More than six-in-ten characterize the situation in Kashmir, pollution, and illegal drugs as very big problems.2 And about two-thirds say this about economic problems, suggesting that Indians continue to confront economic challenges, even if they believe their country is generally on the right economic path. Prime Minister Manmohan Singh receives extremely positive ratings (87% favorable), as do Congress party leader Sonia Gandhi (87%) and her son Rahul Gandhi (85%). The Indian military also receives high marks: 92% say it is having a good influence on the nation, and 65% describe its influence as very good. Indians embrace key elements of economic globalization. Nine-in-ten describe growing trade and business ties between India and other nations as a good thing; 79% believe most people are better off in a free market economy, even if that means some are rich while others are poor; and 72% think large foreign companies are having a positive impact in India.